2016 Subaru XV facelift hits Malaysian showrooms! Offering improved aesthetics, enhanced features and an optimised powertrain to deliver a more enjoyable driving experience, Motor Image Malaysia today had launched the all-new MY16 Subaru XV. The new XV will be available in two variants which are the 2.0i and 2.0i-Premium, and will be priced at RM 121,000 and RM 125,000 (before GST, w/o ins.) respectively. The Subaru XV features a hexagonal grille and C-shaped headlights incorporated into the design of the vehicle, coupled with sharper contour lines running along the front bumper, fog lights and taillights. The exterior also gets a new rear combination lamp as well as 17-inch sport rims for that sleek styling. 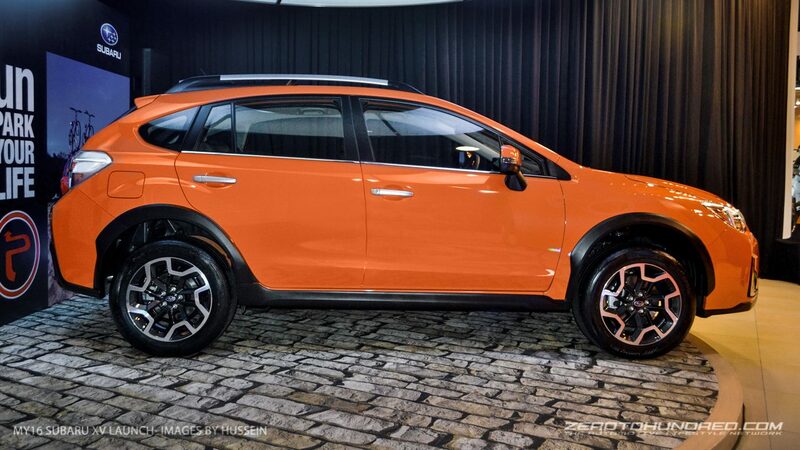 As for the inside, the XV gets a premium cluster display and quality leather wrapping the seats and leather shift boot with a touch of orange stitching. The car now comes with features like a multi-function display, push start and smart entry, as well as aluminium pedals and electric driver seat. Powering the XV is Subaru’s renowned 2.0-liter four-cylinder Boxer engine that makes out 150-horsepower and 196Nm of torque. Coupled with the Subaru All-Wheel Drive system, the XV is able to achieve 7.9litre/100km. The Symmetrical AWD combined with Vehicle Dynamic Control (VDC) system offers a smooth and nimble handling regardless of the road condition. Ever since the SV’s debut, the XV has won “Five Stars” in various global automotive safety tests such as Japan New Car Assessment Program (JNCAP), Euro NCAP, Australia NCAP, and Asean NCAP, Top Safety Pick for insurance Institute for Highway Safety (IIHS) in the USA.Customers will have six colours to choose from for the Subaru XV – Pure White, Ice Silver Metallic, Desert Khaki, Tangerine Orange Pearl, Dark Grey Metallic, and Obsidian Black Pearl. The all-new MY16 Subaru XV is available for booking at all Subaru showrooms nationwide.